You might have been perusing the produce aisle recently and seen a fruit called a Champagne Mango. They’re somewhat new to many parts of the US, but they ain’t new in the Big Picture view. The Champagne, also known as an Ataúlfo, (and young, baby, yellow, honey, or adolpho), is a well established Mexican cultivar. Champagnes are gorgeous; big, heavy, golden-yellow beauties that are somewhat pear shaped. They’re thin skinned, with deep yellow, rich flesh and a very skinny pit. They’re quite high in sugar, with a tangy-sweet flavor, rich in vitamin C and dietary fiber. Down in the Mexican state of Chiapas, when Ataúlfo Morales bought Some land back in 1950, there were already bearing mango trees on the property. Around eight years later, a researcher from the Mexican Commission of Pomology heard of Señor Morales’ mangoes and came to have a look. He went off with samples and stock which he named Ataúlfo, in honor of the property owner, and the rest is history. If you like mangoes, (and even if you don’t), you owe it yourself to try these beauties. While they’re a real treat to peel and eat straight away, here are three of our favorite things to do with them. 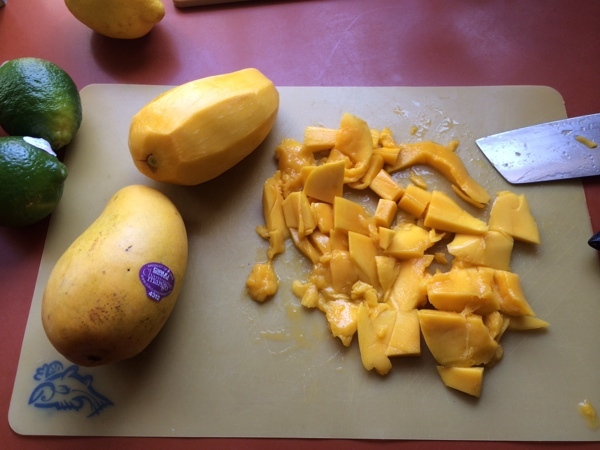 Rinse, Peel and roughly chop the mangoes; you’ll want to kind of shave the meat away from the skinny pit. 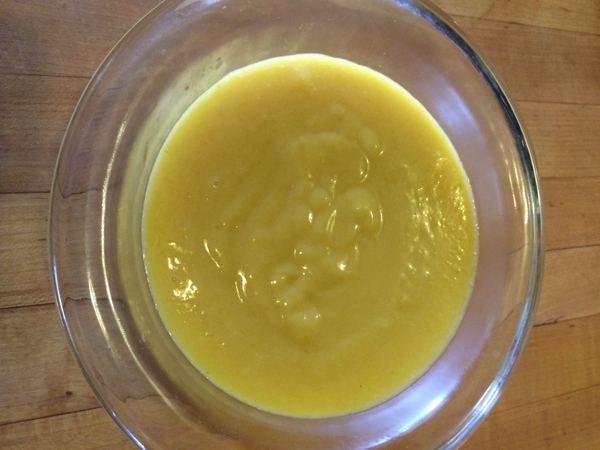 Purée the mango chunks with a stick blender or food processor. You want to end up with about 1 cup of purée. Rinse, zest and juice the lemon and lime, then set juice and zest aside. Cut very cold butter into about 1/2″ cubes. Crack eggs into a mixing bowl and whisk lightly. For cooking the blend, a double boiler is best. If you don’t have one, work with a bowl or pan that will fit comfortably inside a larger one. Fill your double boiler bottom or pan about 2/3 full of water and heat over medium flame. You want the water steaming, but not simmering when you’re ready to cook. 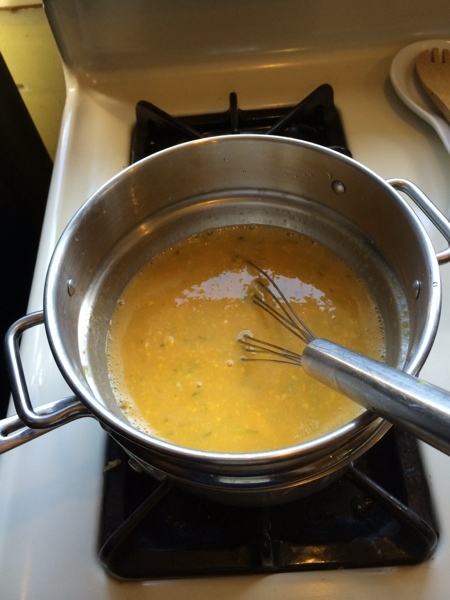 Combine the eggs, lemon and lime zest, citrus juice, the agave nectar or honey, and a pinch of salt. 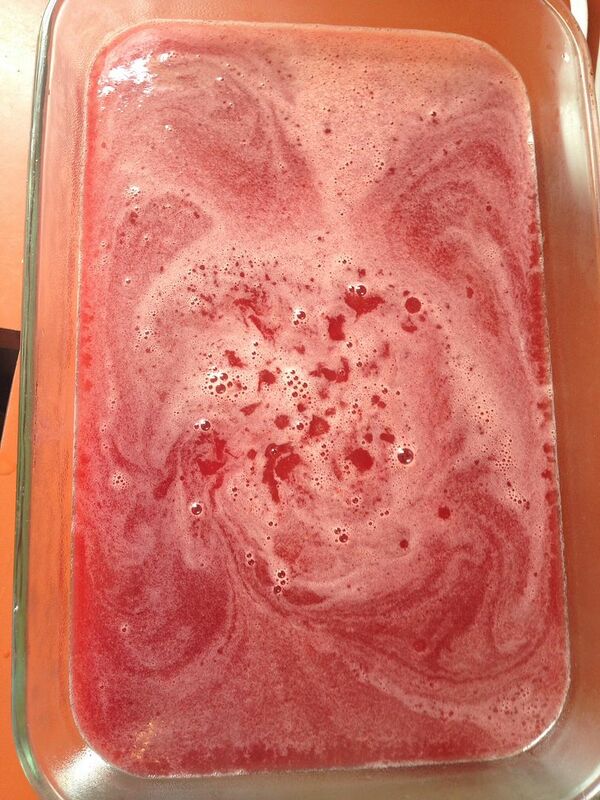 Whisk the mixture until fully incorporated and evenly colored, about 2 to 3 minutes. 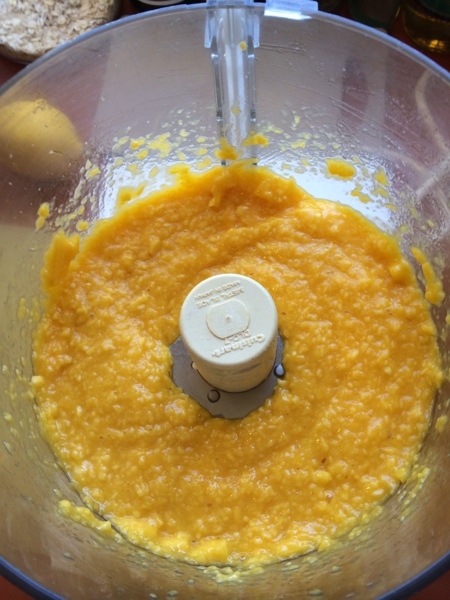 Add the mango purée to the blend and whisk for about a minute to fully incorporate. Put your bowl with the blended ingredients over your pan filled with hot water, (Or double boiler). Allow the mixture to heat, stirring gently but continuously, for about 3 minutes. Start adding the butter in small batches of 6 to 8 cubes, whisking steadily and allowing each batch to melt and incorporate before adding the next. Again, a curd is an emulsion, so the butter, (fat), needs time and gentle whisking to properly marry with the egg and fruit blend. When all the butter is melted, continue whisking gently and steadily until the curd begins to thicken noticeably, about another 2 to 3 minutes. Remove the curd from the heat. Transfer the curd to a fine mesh strainer over a glass or steel bowl and use a spatula to gently strain the curd through the strainer. You’ll end up with some zest and fiber that doesn’t make it through. A small dish of this lovely stuff is a remarkably delicious desert, or an excellent palate cleanser after a heavy course in a fancy meal. Try it on freshly made shortbread with strawberries for a real treat. NOTE: You may substitute coconut oil for butter for a dairy free variation. 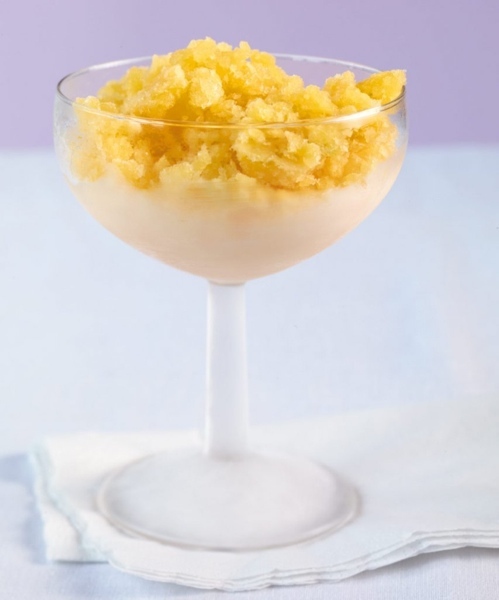 Granitas are the pure essence of fruit and natural sweeteners. With no diary on board, they’re actually not at all bad for you either. This version was the best we’ve made, of any fruit. Rinse, peel and rough chop the mango flesh. Rinse, zest, and juice the lemon and lime. 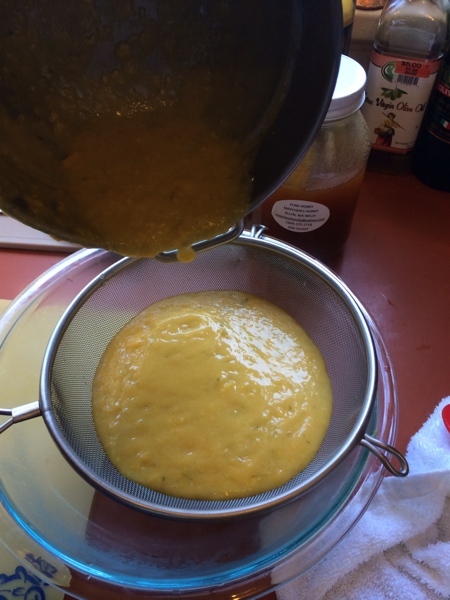 In a food processor or blender, purée the mango until smooth and uniform, about 1 to 2 minutes, stopping to scrape down the sides with a rubber spatula as needed. Add the water and honey or agave to a sauce pan over medium heat. 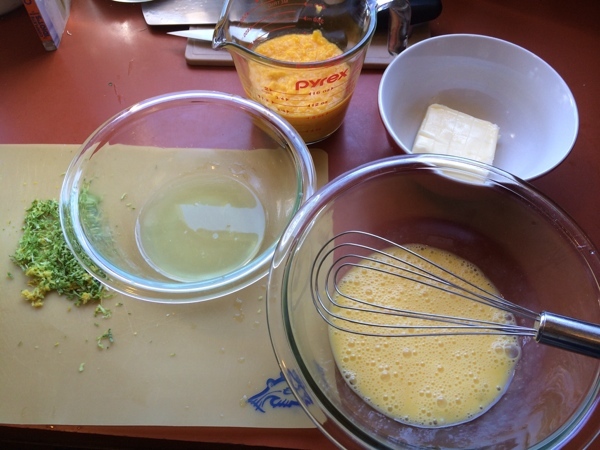 Thoroughly melt the sweetener, then add the purée, zest, lemon and lime juice, and stir to incorporate. 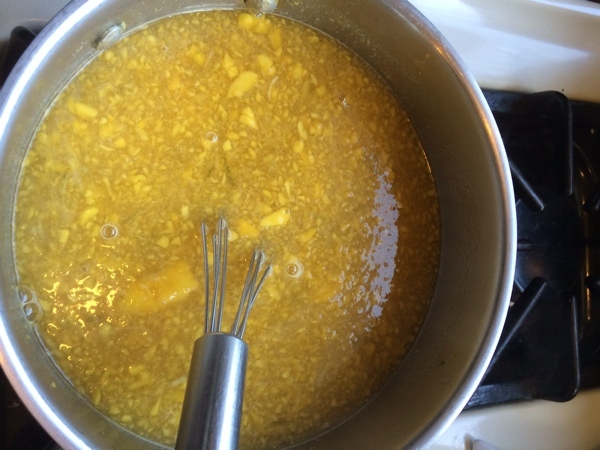 Add the puréed mango and stir steadily and gently until the blend starts to simmer. 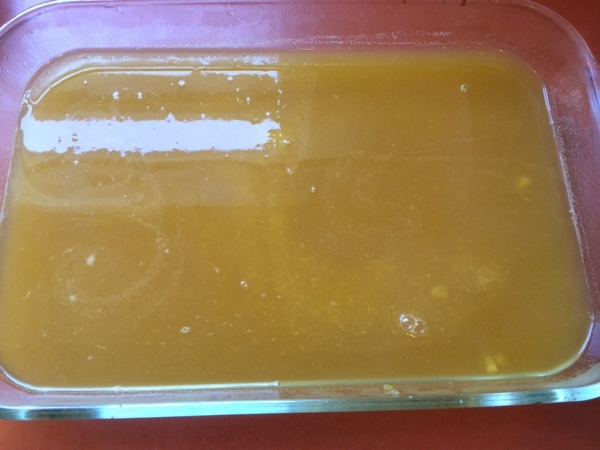 When the whole blend is evenly mango colored and starts to thicken slightly, remove it from the heat; the whole heating process will take around 3 to 5 minutes. Remove the mixture from heat and pour the blend through a single layer strainer into a 9-inch-square shallow baking pan. This pan size works best ­because it provides a large surface area, a key point in speeding up the freezing process. To further hasten freezing, use a heavy steel or glass pan. Put the pan in the freezer and stir about every hour with a large fork, times down like you’re raking the granita. 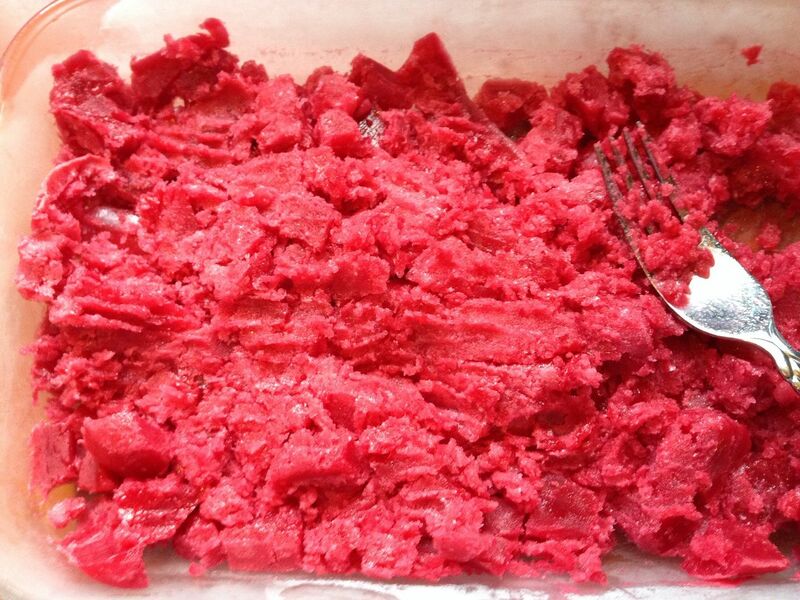 Depending on your freezer temp, it will take around 3 to 5 hours for the granita to freeze completely. You can eat the granita as soon as it’s frozen through, but the flavor will genuinely develop appreciably if you transfer it to an airtight container and freeze it over­night. When you’re ready to serve the granita, just scape up the shaved ice and fill a chilled margarita glass, band top with a mint sprig. 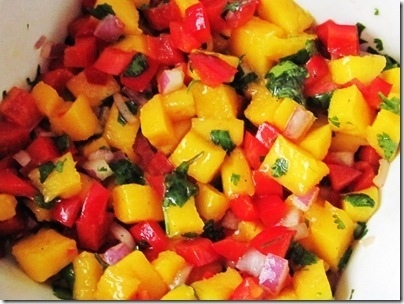 Mango salsa is a real treat; the counterpoint of sweet and heat is great with fish, poultry, and pork. Try it on freshly scrambled eggs too. Rinse all fruits and veggies. Peel and dice mango. Core, seed and dice the tomatoes. Dice the onion. Chiffonade the cilantro. Juice the citrus. Granitas are a lovely, light alternative to ice cream or sherbet that contain no dairy at all and are super simple to make; if you’ve never tried one, it’s time. This version highlights the tart sweetness of cranberries and citrus and is, quite frankly, stunningly pretty. 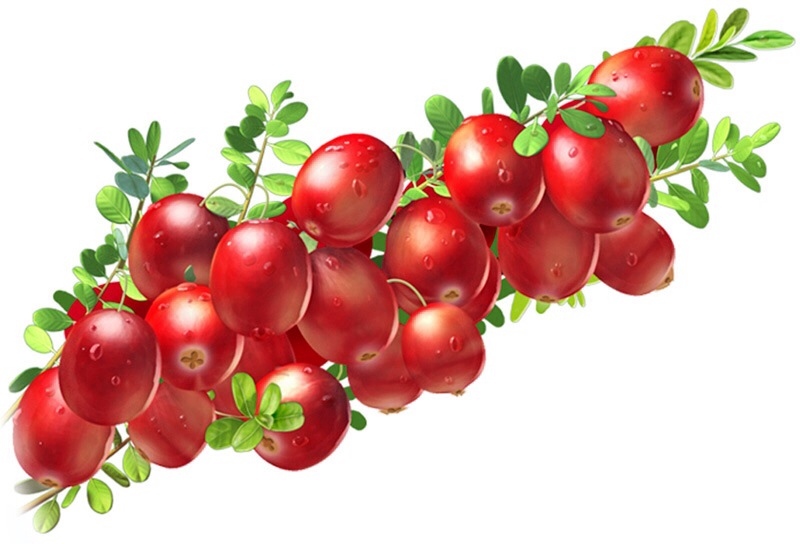 So, we’re highlighting cranberries. Why? ’cause we typically just we haul them out once a year or so for the holidays, and that’s not right. Cranberries incredibly tasty, make gorgeous food, and are darn good for you as well. They’re not only rich in Vitamin C, but have excellent infection fighting properties as well, as anyone who’s had a urinary tract infection knows. Cranberries contain compounds known as condensed tannins, which are potent antioxidants with known anti-inflammatory properties. Cooking does not degrade tannins, so here’s a delicious little fruit that’s remarkably healthy even when we do stuff to ’em. Here’s how you granita. 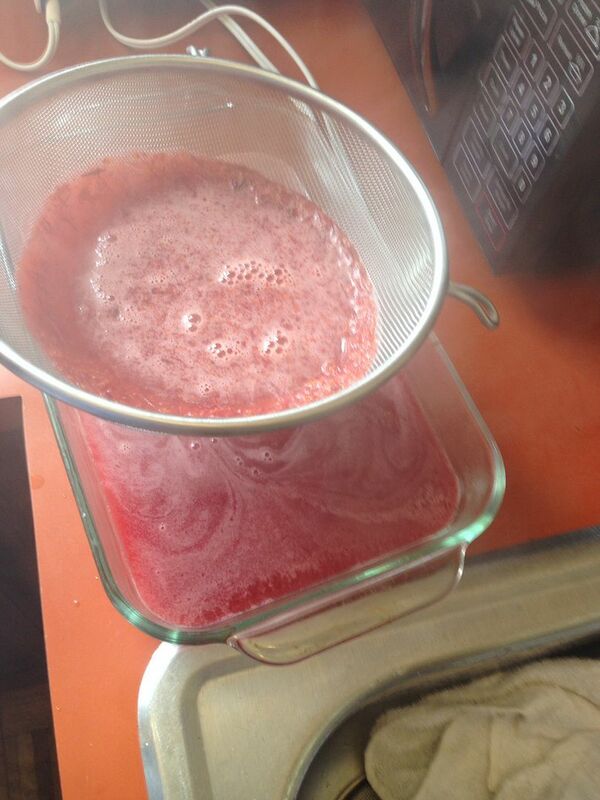 Thoroughly rinse cranberries and citrus. If your citrus has been waxed or treated, put them whole in a bowl containing ¼ cup white vinegar mixed with 4 cups cold water. Allow them to soak for about 15 minutes, then rinse in fresh water and dry with a clean towel. Zest all citrus, then juice each into separate small bowls or cups. 1/2 teaspoon of orange, lemon and lime zest. 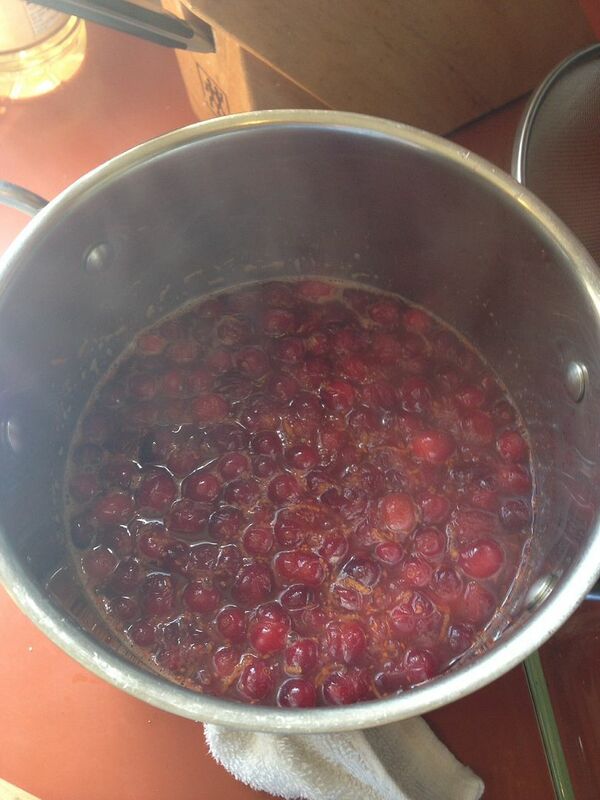 Heat to a fast simmer, stirring occasionally, until the berries start to pop, (about 5 minutes). Remove pan from heat and purée the ingredients with a stick blender; be careful, the blend holds heat well and is sticky. Carefully pour the mixture through a steel mesh strainer, into a glass baking pan, (around 9″ x 12″ is right, and a half cookie sheet with sides will work if you don’t have the pan). Press gently on the mix with a spatula; you’ll end up with some skins and zest that won’t make it through the strainer. Slide the pan into your freezer for at least 4 hours, (and overnight is fine), along with 4 margarita or Marie Antoinette champagne glasses. Freeze until the granita is completely set. Scrape the granita carefully towards with a fork while holding the pan steady, until you’ve got a nice shaved ice consistency. 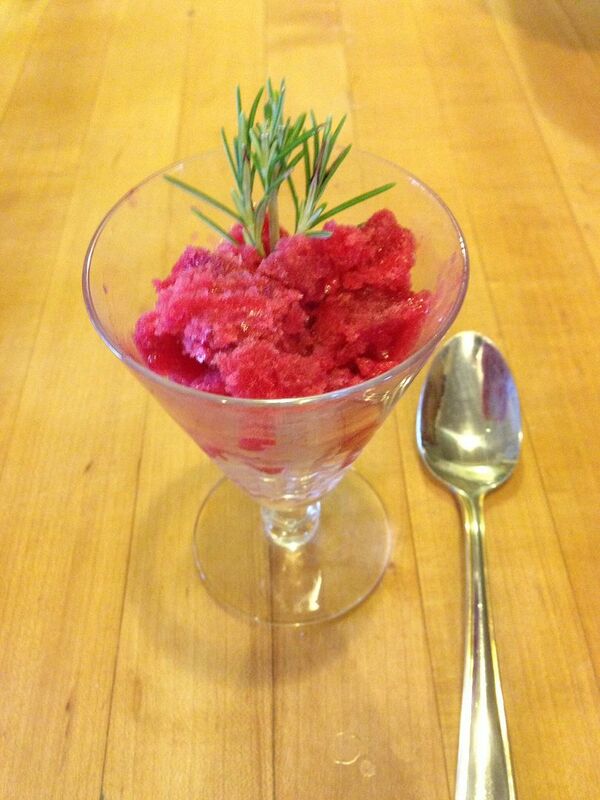 Scoop granita into the chilled glasses, garnish with a Rosemary sprig, and serve immediately.